If you have ever been a worker (which we assume almost everyone did even once), then “Horrible Bosses” is the perfect movie for you. And you know why? The answer is simply obvious – who loves their boss anyway? Most of the time, bosses are hell-bent to make subordinates’ lives a living, breathing hell of an experience. While “Horrible Bosses” was kind of trippy in some scenarios (the protagonists were either completely desperate or just plain naïve while the three bosses a little bit exaggerated and stereotypical), bottom line is that it is a wild, zany and a seriously funny movie. While it may not compete with the best out there, it will leave you completely satisfied and a little bit de-stressed and healthier due to the non-stop laughter you’ll be doing for almost two hours. For Nick (Jason Bateman), Dale (Charlie Day) and Kurt (Jason Sudeikis), the only thing that would make the daily grind more tolerable would be to grind their intolerable bosses into dust. Unfortunately, quitting is not an option for all of them so with the benefit of a few-too-many drinks and some dubious advice from an ex-con (Jamie Foxx) they meet at a bar, the three friends devise a convoluted and seemingly foolproof plan to rid themselves of their respective employers permanently. There’s only one problem - that even the best laid plans are only as foolproof as the brains behind them. “Horrible Bosses” is so witty and funny not because of the wacky scenarios and the completely crazy (while some may say plausible) premise but because of the characters and the actors that played them. The story might not be all-original, some scenes may feel a little bit forced just to keep the story moving forward or yes, the film is a little bit stereotypical (sensitive types might even deem it racial) but all these faults we can forgive because of the cast. If it’s not the subordinates who make you cringe then it’s the bosses turn. It’s a well-balanced two-sided affair that you rarely see on the big screen. The chemistry just simply and the characters themselves have their own distinct nuances that contribute to the film's hilarity. 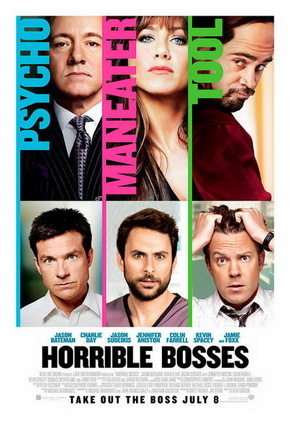 Some may see “Horrible Bosses” as a dirty, crass and low-brow comedy film but we beg to differ. At the end of the day it’s funny as hell and that’s what you are looking for in a comedy right?